After an inspirational series of meetings in London 24-26 March, the new board of Unconditional Basic Income Europe (UBIE) gets ready for a busy year ahead. Our weekend of events themed ‘Basic Income: not just a pretty idea’ in London was a big success. 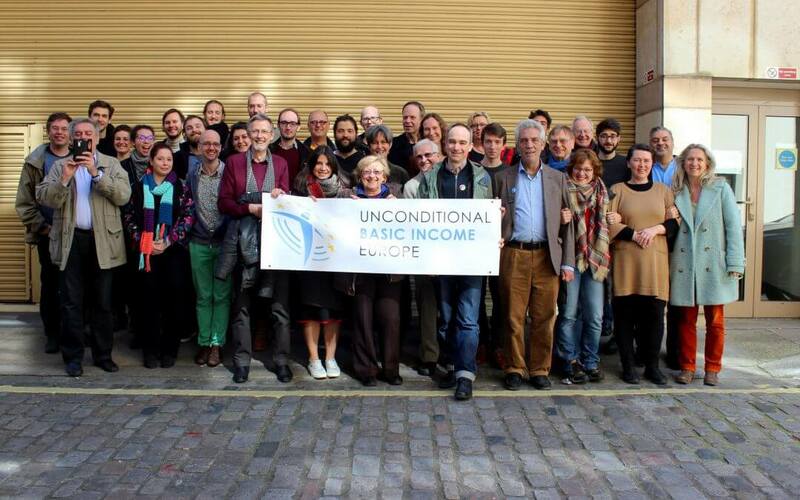 Over 60 members and friends of Unconditional Basic Income Europe from 12 countries attended throughout the weekend. On Friday, 24th March, we had a tour of the City which focused on London’s 1000-year working history, with a brief stop on the river’s foreshore. That evening 11 activists from different parts of Europe reported on the situation of basic income in their respective countries. We are grateful to Father David Allen for providing St Clement’s Church, Finsbury for this meeting. On Saturday 25 March we had a great conversation with four British trade unionists who have been working in support of basic income in the UK, with Kevin Brandstratter, Nikki Dancey and Martin Smith of the GMB union, and Becca Kirkpatrick from Unison. We explored the reasons for stronger UK union support for the idea while unions in other European countries have either ignored UBI or been openly hostile. Some of these reasons are structural – in several European countries trade unions share responsibility with the state for dispensing unemployment benefits. In the afternoon we held workshops on several topics and projects for UBIE: A new European Citizens’ Initiative (ECI); UBIE external communications; Future Lab (a multimedia exhibition featuring UBI); UBI political parties around Europe; lobbying the EU. As always, meeting in real life renewed people’s energy for carrying these projects forward. On Sunday 26 March during the General Assembly we looked at two practical tools for people to use back home, and which we hope to implement within UBIE: Introductions to developing a Theory of Change and a Power Structure Analysis. The General Assembly also elected a new board for UBIE. Dániel Fehér from Hungary is now Chair, Lena Stark (Sweden) and Anja Askeland (Norway) are Vice-Chairs, Aurélie Hampel from France is Board Secretary and Ulrich Schachtschneider from Germany is our new Treasurer. The meeting expressed its gratitude to the board members who stepped down this year: Barb Jacobson (UK) who was UBIE’s Chair since the network’s founding in 2014, Nicole Teke (France) who was Vice-Chair since 2016 and Quentin Fabri (Belgium), UBIE’s first Treasurer. All three wished the new board well in taking UBI-Europe’s work forward. We are also very grateful to the GMB Union for hosting these two days. We look forward to meeting the challenges and opportunities this year! The next meeting of UBIE will take place in Lisbon, 24 September, ahead of the BIEN Congress 2017 to be held 25-27 September. More details to follow. N.B. : Many people put a great deal of time and energy into organising this meeting. Nevertheless, we had large expenses – and will have more in the future on our way to becoming a more effective activist and lobbying network. If you can, please consider a donation to UBIE – or even better, set up a regular contribution!